If you follow the Lewis and Clarke route, you’re sure to have the time of your life. Not that Lewis and Clarke is a rap or hip hop band that idolizing fans would follow to the ends of the earth, but this route – close to highway 12 – will take you to the finest recreational spots of the state of Washington, some of which are right in Burbank. Rest and recreation in Burbank are a sacred tradition and the generous land area provides every type of leisure activity that will satisfy the most demanding and most discriminating of wholesome hedonists. In fact, Burbank’s leisure slogan should be “thou shalt not want” because there’s bound to be something for everyone. Whether you’re a keen observer of nature and environmental life, a water enthusiast, an experienced camper, a cultural buff, an avid hunter or a contented spectator of festivals and city parades, Burbank will furnish the activity, the memory, and the compulsive urge to come back for more. 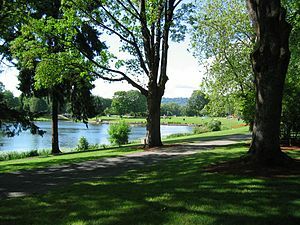 If boating stirs a sentiment or two, arid Lake Sacajawea in southeast Washington offers visitors panoramic views with hardly any obstructions, given that there are few trees in the area. There’s the Sacajawea Heritage Trail that crosses parks and neighborhoods of the Tri-Cities and goes for 22 miles, an educational experience that should not be missed by lovers of nature and open spaces. If you prefer more gentlemanly sports, Burbank and its surrounding areas are proud of the excellent golf courses that are open most times of the year, thanks to the area’s mild and well-mannered climate. Wives accompanying their husbands on business will have ample space to meander along Kennewick’s Columbia Center Mall. It has attracted a growing number of shoppers from nearby towns and communities. Burbank also gets to benefit from the hoopla of professional sports in the Tri-Cities area because three teams hug the limelight during the sports season: the National Indoor Football League: The Fevers, the Tri-City Americans of the Western Hockey League and the Tri-City Dust Devils who play in Pasco. Feel like bird watching to while away your time? The Pioneer Park Aviary in Walla Walla County houses about 200 different species of winged creatures - colorful pheasants, doves and ducks – yes geese too – from all over the world. 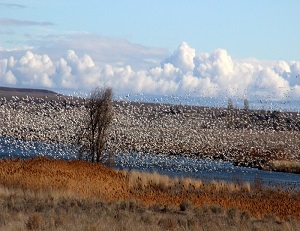 Let’s not forget the McNary National Wildlife Refuge which is Burbank’s feeding and rest area for about 100,000 migrating waterfowl – their populations are largest from November to February. It is located off highway 12 south of the Snake River. The park is run by several volunteers and of course anyone who has a soft spot for wildlife is welcome to share a bit of his time. There are teen, youth and adult programs for the Fall season this year including volleyball, basketball, martial arts and track and field. For those with an adventurous bent, there’s nearby Benton with its fair and rodeo in August, while Burbank’s other sister cities offer jazz music and stock car racing.